The side of our refrigerator is slowly beginning to fill up with "Save the Date" cards. You know, those cards that are sent before the actual wedding invitations arrive? Well, we've gotten a few of them recently and I am beside myself with joy over it. I LOVE WEDDINGS. Have I told you that before? LOVE.THEM. I grin just thinking about them. I really hope there is a dance floor at these weddings. And I really hope they don't mind if I monopolize said dance floor. Chris says, "Maybe this is what we've been missing in our life lately. Weddings." You see, it's been over a year since I've been to one. And prior to that...well, er, I just don't know. We've gotten older and our friends have gotten older and the weddings have slowed down. 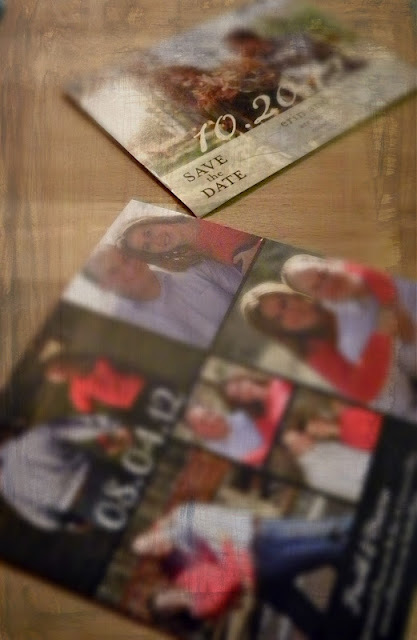 These precious "Save the Date" cards? Yeah, um, they're from former students of mine. 2. Makes my heart sing because they are inviting me (ME! ), their former middle school teacher, to their weddings.